Years ago I was in Philadelphia for a wedding, and later on a second trip to run their marathon (in 2004). Both times I really wanted to visit the Mutter Museum, which is full of medical oddities. I never found the time. A couple of weeks ago, Paul went to a work conference in Philly, and I tagged along. My parents were nice enough to watch the kids. 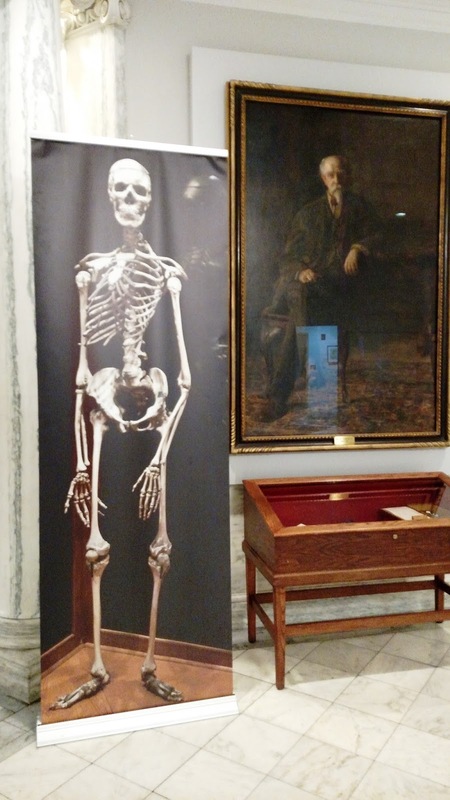 I finally got to visit the Mutter Museum, when Paul was in conference sessions. It was excellent. Unfortunately, they didn't allow any pictures inside the museum itself - just the lobby. 1. Slides of Albert Einstein's brain, along with information about how his brain differed from the average human's. 2. The tallest skeleton in North America, of an individual afflicted with gigantism. If I remember correctly, it is 7 feet 6 inches tall. 3. A wax replica of a woman who had a horn growing from her forehead (there were other similar models of individuals with horns growing from other body parts. 4. A malignant tumor removed from President Grover Cleveland's hard palate. 5. A large collection of conjoined twins, including the conjoined liver of the famous Chang and Eng Bunker. I've wanted to go for so long, I'd say this counts for checking off a bucket list item. So glad you got the opportunity to go at last! I'd enjoy visiting the Mutter Museum... more so since I just finished reading The Museum of Extraordinary Things. Hm, a little scary it is too - must I had seen all these things? Pretty bizzare, I hope I don't end up there. As a retired RN, I would definitely be interested that museum. So glad you finally got to go. Happy Friday! That sounds like it's so cool! We went to the Ripley's Believe it, or Not museum once. We loved it! I know we'd like this one to! That's interesting and different but I'm not sure I would enjoy seeing those things. Fascinating! If I ever go to Philadelphia I will visit here. I am not sure I would go... but then again, I might. Those sort of things kinda freak me out. I think my guys and I would love it. And hey, I got that tea.. and OMG it's delicious!! I didn't believe it could resemble chocolate, and it's chocolately delish!... and the best part is I indeed got a whole case of it for $28, so I didn't overpay. Amazon! I would enjoy some of it. Was Einstein's brain preserved --or slides of samples--to try to figure out his genius? Well I think it might be kind of interesting in a "weird" way to visit this museum so yeah, I'd go. I was in Philly a couple of years ago and never made it to the Mutter Musuem either. Hum. Don't believe I'd care to go there! At least, not just before lunch. how interesting and yes, i'd go! we were in philly a few years back and i loved it but i hadn't heard of this museum! thanks for linking and have a super week!